"Calculate your MPG Miles per Gallon (UK Imperial Gallons)"
Please bookmark our real world MPG Calculator and try again after using our fuel saving tips (we bet you get another 50 miles out of a tank)! Use your trip counter and reset when you fill up ensuring that the tank is full then when empty fill up to full again noting the mileage covered. Allow the car to coast in gear the last 700 yards up to a junction rather than accelerate all the way. Look out for junctions and ease off the throttle as soon as you can. Drive with a maximum 1/3 to 1/2 throttle - if you get the revs right for the engine load you will not notice much of a loss of power. Avoid using things that drain the battery - because extra pull occurs on the alternator requiring more fuel (aircon is very noticeable). The big drains are rear window heater, blowers & heaters, headlights. Inflate your tires to the correct pressure. (Fully laden pressures or just under seems to give the best MPG but more pressure can increase the mid tire wear if it's too extreme so don't over do it.) Check your pressures monthly or more frequently - if you calculate your MPG and it is lower then your tyre pressures are usually to blame. Hotter engines are more economical than colder ones - changing the thermostatic control or partially blocking the radiator MAY help on SOME cars. (Run the engine too hot and you will break it - you have been warned.) Use TorqueCars MPG tuning articles for some practical tuning tips to improve your cars MPG. Keep the car well serviced - change the plugs, oil, filters and check the bearings and ensure that the brakes are not dragging. Fully disengage the hand brake as well when you drive off! Avoid idling the engine for long periods of time - turn it off at railway crossings etc... If there are long traffic delays pull off to a motorway service area and grab a coffee until the traffic dies down. Take off the roof rack as the drag this creates really does increase your fuel consumption. Put some injector cleaner like BG44K Petrol engines or BG244 for diesels in - it really does help keep things at peak efficiency and in my car added 2 mpg! Fuel magnets did not work for me I wouldn't bother with them!!! The science would dictate that you'd need a powerful electro magnet to make any difference to fuel. Use this MPG calculator again - it will remember your last 4 results to enable you to track your success! We find that most people who follow our tips save between 20% and 30% in fuel between each fill up. 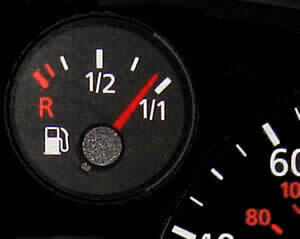 Remember also that a drop in MPG may indicate a problem with your car so it's a good idea to track your MPG regularly. On board trip computers are not always that reliable so you can't beat a brim it and read off the miles calculation. This entry was filed under Fuel Calculators, Tools. You can leave a response below or join our forum to discuss this article and car modification in detail with our members. MPG calculator using km. Kilometers to UK MPG. hi, wow it really works! Have a 1.6l mk3 golf i gained 16 miles out of £20 worth of fuel, which would equate to 48 miles per tank. just by changing my driving style. 35.8MPG on urban driving. better than what the factor said! thanks! Try keeping a small cash book & pen in the glove compartment to record all your fuel-filling (dates, prices, litres, mileage/trip etc) and you’ll soon spot any differences in consumption. It can be a warning flag for minor problems too, before they get major, so If you can’t find valid reasons for a drop in fuel economy, give the car a timely check-up. For example, a leaky exhaust might get spotted in time for a repair, instead of a full replacement! I have been driving under a year and already started to drive looking way ahead, Out of a 1.2l corsa i can get 42mpg quite often and that doesnt really involve driving stupidly slow. Just carefully and not really using the breaks just coasting down. I have only been getting 300 miles (30mpg) to a tank on a brand new 1.2 corsa, with an extra few pounds of air in the tyres I’ve been able to increase it to 320 miles (32.33). Hopefully this will increase when the engine has been fully run in. I’m regularly getting more than 30mpg out of my Land Rover Defender (2004) Td5. Its shaped like a brick and weighs 2 tons. If your fuel economy is worse than this in a small car, somethings wrong or you have an automatic gearbox and a heavy right foot! I have been using all tips from the above article for years. Last year I have converted My petrol vehicle to run on LPG which halved My fuel bills. Really easy to use this site. I am a bit sad to only get 26 mpg from my 14 year old Toyota Avensis. But…. when it has got through last 3 MOT’s needing only a headlight, and is as reliable as a Blackpool Donkey (that is meant as a real positive) – I am reluctant to upgrade. I recycle all the time, so eco-credentials not totally trashed! Very good site thanks, I Have a Rover 75 diesel auto and using your tips, out of the last 1294 miles have used 184.62 litres which I think relates to 31.86 mpg of which 280 miles towing a caravan quite good eh.? cheers. After buying a Mazda MX5 I have been tracking my fuel which is doing 35 mpg. Interesting and reflects my experience. My Honda Jazz has CVT auto gearbox. I find this far more efficient (fuelwise) than conventional auto box. I regularly use engine breaking by dropping to S mode or even L mode. By far the greatest improvement in consumption came from anticipation driving. If you drive an automatic with a tiptronic our manual gear change option chose manual on the motorway in top gear. It will prevent the gearbox from changing down when you crest hills and reduce your consumption… also with some practice you can up change on normal driving ahead of the automatic rev threshold ..I can impact upto 20% on my MPG by selecting manual changes… you just need to practice.. Petrol and diesel are becoming very expensive , and always seem to go up , never down .I used to have a lightweight racing bike in the back of my van , and sometimes rode into town , we should all cycle more and use less fuel . If we act in mass we reduce the demand for high fuel , and therefore it would be brought down . Supply and demand here..
Make a gap if you are in a long line of traffic so the locals can get out and it helps with with space to engine brake.Remember that touching the brakes costs money and momentum.Love the site. Just used the calculator after some modifications to the ignition system, air intake and exhaust, reset the emc so it’s learning g again from its sensors and…..
13.99mpg a gain of 1.98mpg.